The Saints signed wide receiver Simmie Cobbs off of the Redskins’ practice squad, a source tells Nick Underhill of The Advocate (on Twitter). Cobbs will take the roster spot of tight end Erik Swoope, who was informed of his release on Thursday. Cobbs was an all-Big Ten receiver at Indiana and caught 72 passes for 841 yards in 2017. He’s an intriguing pickup for a Saints team that has lost several big-name receivers to injury throughout the year. For now, Cobbs will slot in as the Saints’ No. 6 receiver behind Michael Thomas, Tre’Quan Smith, Austin Carr, Keith Kirkwood, and Tommylee Lewis. Earlier this week, veteran Brandon Marshall was dropped from the roster, so there’s room for reinforcements. The addition of Cobbs could mean that wide receiver Ted Ginn will not be activated from IR before the year is through. Then again, given all of the Saints’ roster juggling in recent days, nothing can be ruled out. Swoope’s stay in New Orleans lasted less than 24 hours and there’s no guarantee that Cobbs will get to take his coat off and stay awhile if Ginn is given the greenlight. The Saints, who have already clinched the NFC South, can virtually clinch a first round bye with a win over the Panthers on Sunday. A win in Carolina coupled with a Bears loss in Green Bay would completely seal the deal for the Saints, allowing them to rest any banged up players in the final two weeks. Indiana wide receiver Simmie Cobbs will forgo his fifth season of collegiate eligibility and enter the 2018 NFL draft, as Cobbs himself announced on Twitter earlier today. 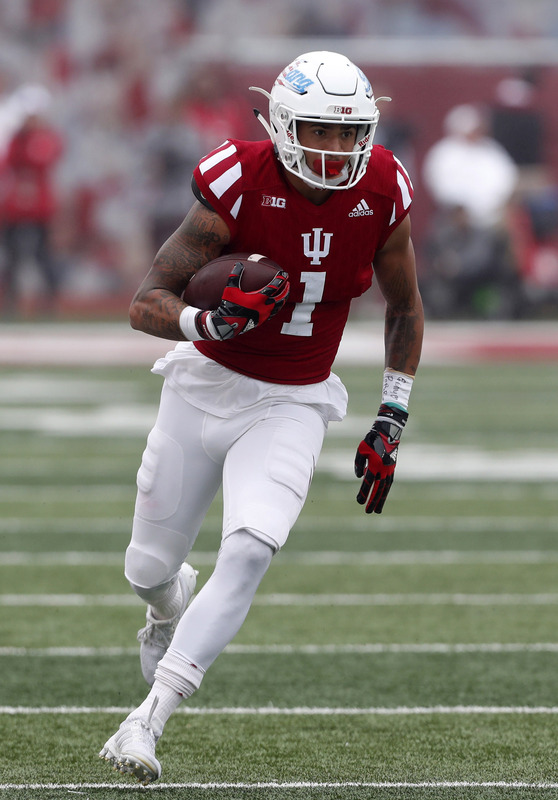 Cobbs initially broke out for the Hoosiers during the 2015 campaign, when he posted 60 receptions and averaged 17.3 yards per catch. An ankle injury forced Cobb to take a medical redshirt in 2016, but he posted 841 yards and eight touchdowns during his most recent season while earning first-team All-Big Ten honors. Cobbs, who stands 6’4″, 200 pounds, is considered one of the more intriguing pass-catching prospects in the 2018 draft. As of November, Matt Miller of Bleacher Report ranked Cobbs as the draft’s fifth-best wide receiver, while USA Today’s Luke Easterling recently placed Cobbs 13th among wideouts. As such, Cobbs is expected to come off the board by the end of Day 2.